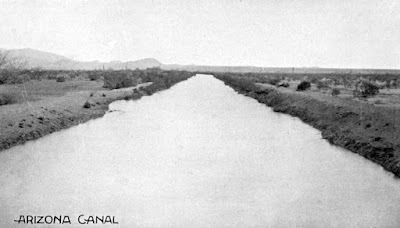 Let's walk along the Arizona Canal in 1895. We're at the Granite Reef Dam, which is on the Salt River, on the Salt River Pima Indian Community. We're walking west. The canal was completed in 1885, so it's been there for ten years. It's used by, and protected by the Pimas, and goes all of the way across the northern part of the Salt River Valley to Peoria, Arizona. We'd better get going, it's a long walk! The Arizona Canal was privately funded, and dug by hand, using man and mule-power. More about the men who build the Arizona Canal. And even ten years after its completion, it's waaaayyyyy out in the desert. As we cross over what is now Pima Road out of the Indian Reservation to what is now Scottsdale, there's hardly a trace of life, except cactus and Gila Monsters. Watch where you step! The canal does a sharp bend right about there and starts heading south where it goes around the base of Camelback Mountain. At about where 56th Street and Indian School Road will be someday, we stop at the falls and eat lunch. The water from the canal tastes muddy, but it's fresh. From there the canal begins to curve around the west side of Camelback Mountain and starts going northwest. We stop and look south towards Phoenix, which has been there since 1870. Not a lot of tall buildings yet, but it's just visible. The city limits are Van Buren and 7th Street, so it's quite a distance to town. There are scattered ranches in the valley, but not a lot yet. Some people say that a great city will be built here someday. It's hard to believe. At about where 24th Street will be someday, we climb up onto a hill which gives an awesome view of the valley. This would be a great place to build a mansion some day! When we get to about where 19th Avenue will be someday, we see a lot of damage from flooding, where the Cave Creek overflows into the canal. Hopefully that will be fixed someday! We finish up at New River, near where 73rd Avenue will be someday. We're just north of Peoria, and Glendale, which are little towns that the Arizona Canal Company has optimistically promised will be real cities some day. Time will tell.